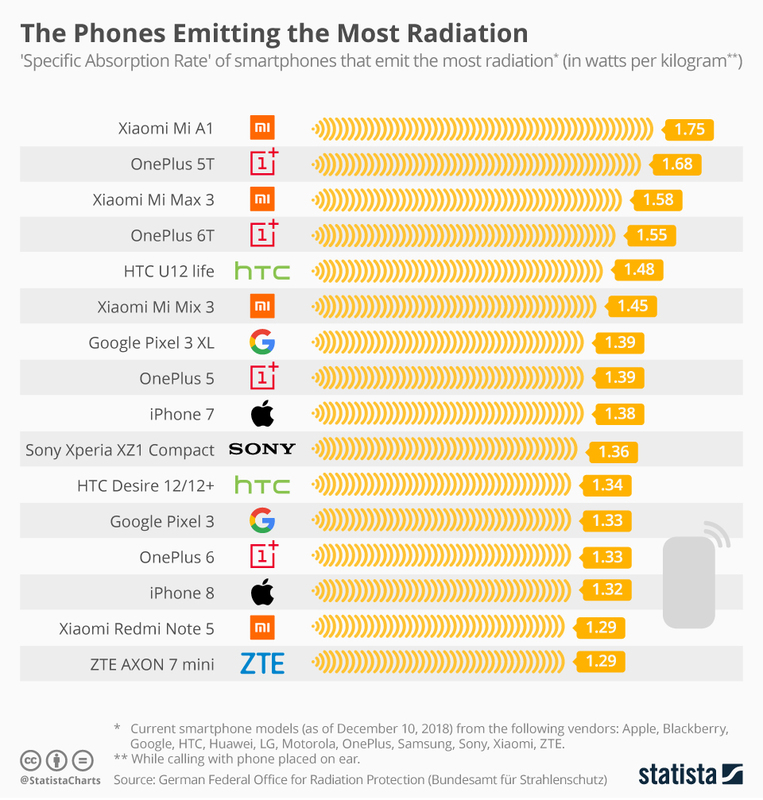 According to an infographic produced by Statista, Xiaomi Mi A1 is a smartphone which emits the highest radiation among the 16 phones which are ranked according to their SAR value. The second phone in the list is One Plus 5T followed by Xiaomi Mi Max 3, One Plus 6T and others. The infographic data shows that Xioami Mi A1 comes with most SAR values, it means emitting most radiation and might be more harmful to health. We all know, smartphones have become ubiquitous in our day to day life. But, keeping us busy with the device has sparked concerns in some quarters that they might pose a health risk in the long run as a result of the radiation that they emit. According to the data obtained by Statista, Xiamoi Mi A1 comes first with 1.73 (value in watts per KG) followed by OnePlus 5T at 1.63. The third and fourth smartphones also belong to Xiaomi and One Plus. The above data is obtained from the German Federal Office for Radiation Protection, which has shortlisted a database of latest and old smartphone showing which handset emits more or least radiations. According to the National Cancer Institute, the human body absorbs energy from devices that emit radio frequency electromagnetic radiation, like phones, and the dose of the absorbed energy is estimated using the SAR measure. Talking about the list, 12 of the 16 smartphones in the list belonging to Chinese companies including OnePlus, Huawei and ZTE, and Xiaomi. In the list, the smartphone which emits lowest radiations is Samsung Galaxy Note 8, coming in at just 0.17 watts per kilogram. 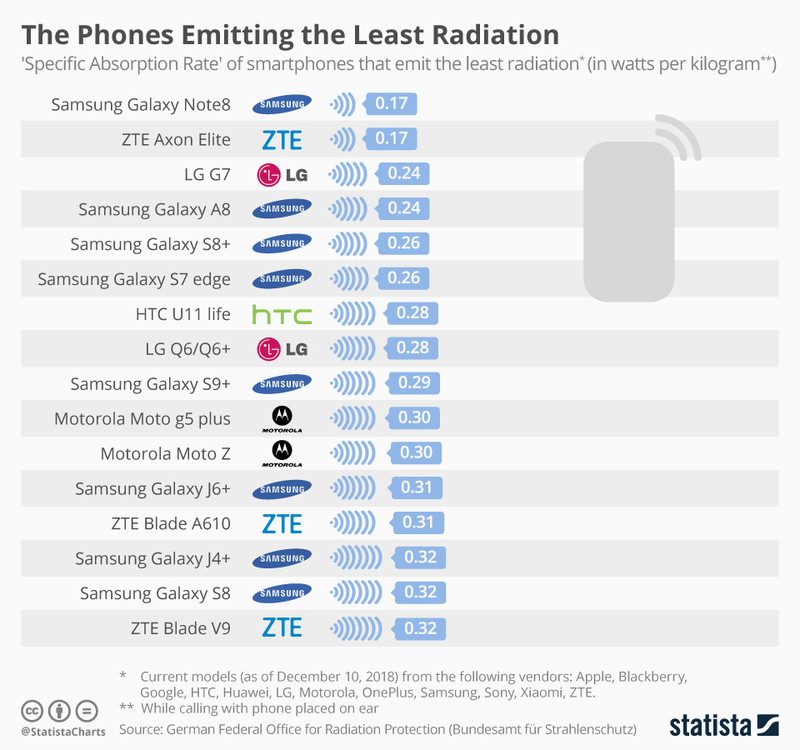 Looking in the list, Samsung fares well in general with five of its smartphones ranked in the top 10 that emit the least radiation. “However, although many studies have examined the potential health effects of nonionizing radiation from radar, microwave ovens, cell phones and other sources, there is currently no consistent evidence that nonionizing radiation increases cancer risk,” according to the National Cancer Institute.